Client failed with this error (-559) while in deep sleep yet attached to a network connection. It read no connected disk, merely timed out with this error in the log. When I returned to the office woke up the machine and re-ran the same script, it ran perfectly. 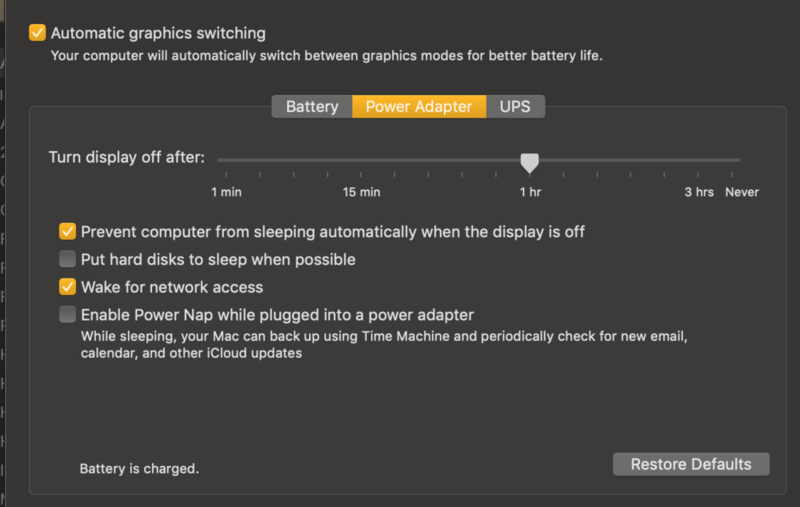 Power settings (System Preferences>Energy Saver>Power Adapter) are the same as they have been, which ran in all modes including deep sleep prior to upgrade. Why?? Enclosing/attaching log snippet, images on power settings, error report. The last I encountered this issue was in September 2016, when the head of Retrospect Technical Support admitted Wake-on-LAN wasn't working. That was a couple of Retrospect Mac major releases ago. Looking at the cumulative Release Notes since then, I see for Retrospect Mac 15.0 bug fix #6477 "Fixed Wake-on-LAN option for different network topologies". I don't know whether that applies to the Support Case I had filed; maybe they actually fixed my bug, but I'm still running the 14.6.0 "backup server" with the 14.1 Client for production. If they did fix it, maybe it got "un-fixed" in Retrospect Mac 15.6; you don't say what version you upgraded from. 15.6 along with 15.5 seem to be "bad releases"— especially for Retrospect Windows, where things that worked under 15.0 don't anymore. Surely I don't need to tell you why and how to file a Support Case, especially since you posted this in a sub-Forum nobody from RTS looks at anymore. Looking at the cumulative Release Notes since then, I see for Retrospect Mac 15.0 bug fix #6477 "Fixed Wake-on-LAN option for different network topologies". I don't know whether that applies to the Support Case I had filed; maybe they actually fixed my bug, but I'm still running 14.6.0 with the 14.1 Client for production. If they did fix it, maybe it got "un-fixed" in Retrospect Mac 15.6; you don't say what version you upgraded from. 15.6 along with 15.5 seem to be "bad releases"— especially for Retrospect Windows, where things that worked under 15.0 don't anymore. Surely I don't need to tell you why and how to file a Support Case. Lord knows, we've filed plenty of those, eh? Yes, I upgraded from 15.0, prior to that I had some issues similarly, but then the OS had different features/choices: check box as I recall allowed the CPU to run always and the display to sleep. Maybe it was the same and only the verbiage was changed on the MacOS side. Don't know. However Mojave is clearly a different animal. So anything like that, I guess could be, "... lost in the sauce." Will call them first, if I can get through. Thanks for the history lesson on 14.6 (14.1 Client). You didn't say if you are running Mojave, may I assume not? Limited Chat functionality as well. Wait times too long. I'm not running Mojave, partly because if I did so my MacBook Pro's SSD would be converted to APFS—and Retrospect Mac 15 still seems to have problems with APFS. However the latest version of my rule of thumb is to never upgrade to a new version of macOS until its last two characters are ".6" or higher, and Mojave isn't there yet. https://www.retrospect.com/en/rscustomers/sign_up?locale=en is a URL for viewing Support Cases. You can't use it to view any Support Cases except your own. I hope you actually filed a Support Case.